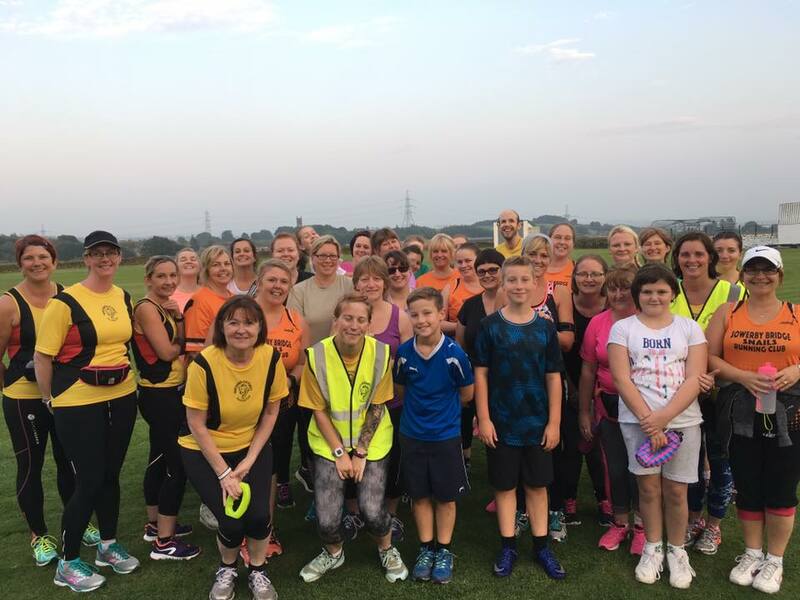 While our very own gossip girl blogger Johnny has a week off, here’s Simon to tell you about our recent parkrun takeover in Brighouse over the Halloween weekend. 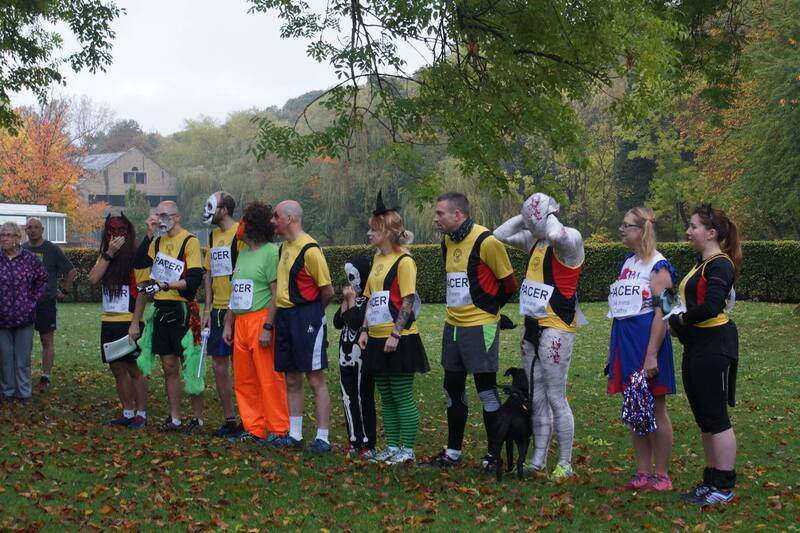 What else could be more scary than a group of zombies, witches, vampires, skeletons and pumpkins all arriving at Wellholme Park in Brighouse at 8am on a Saturday morning? 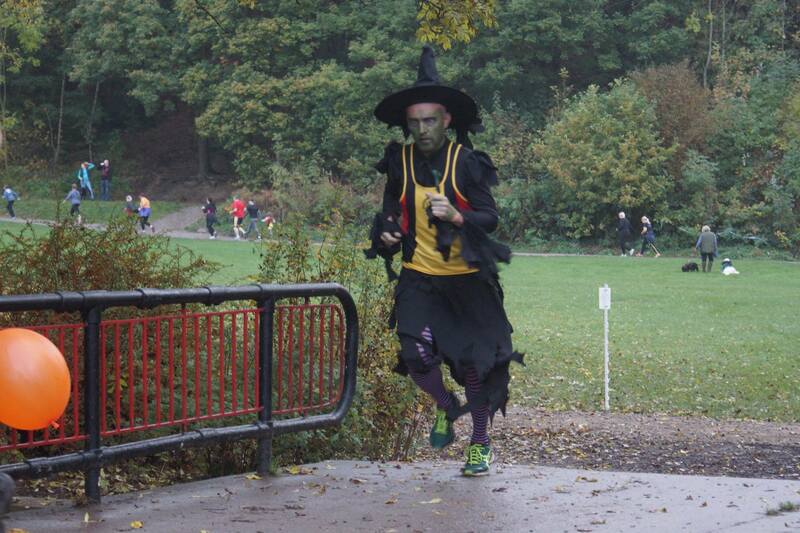 3 months ago it might have been a different kind of event, but on Saturday 29 October 2016, it was time for the first Brighouse parkrun Halloween event – run by the Northowram Pumas. As always, Team Puma turned out in force to get involved and we’d have been lost without them. 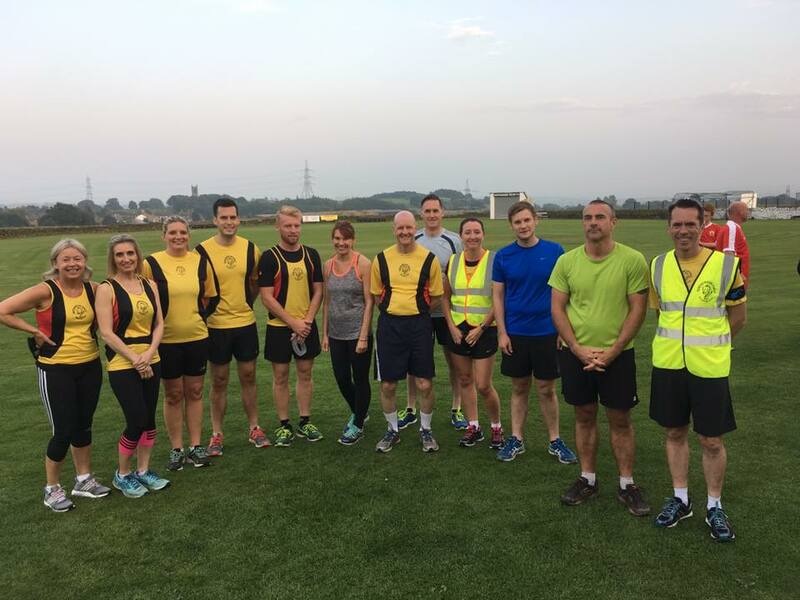 As part of our takeover and proving popular when we’ve done it before, we had pacers ranging from 20mins through to 34mins to help people round. 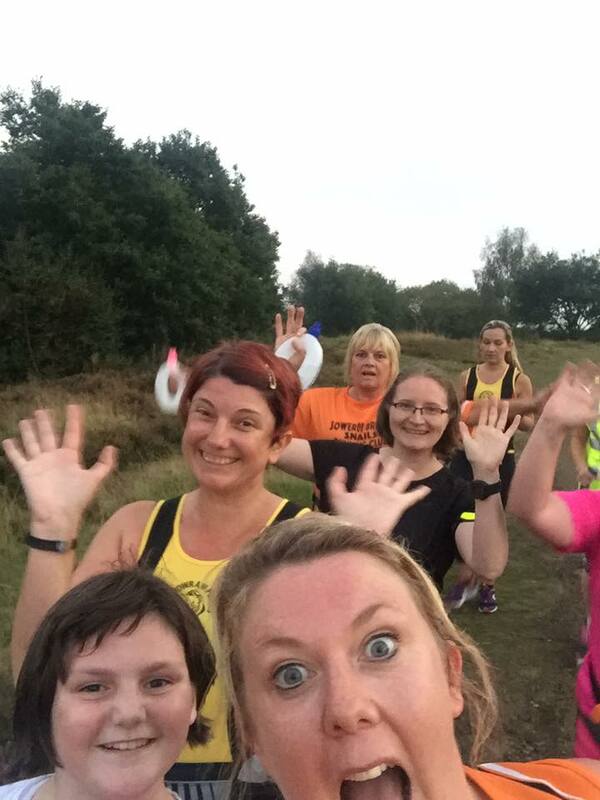 When reading so often about people wanting to beat a personal best (PB) but struggling to break the ‘glass ceiling’ on their own,I’ve always been a fan of running with others to get better. 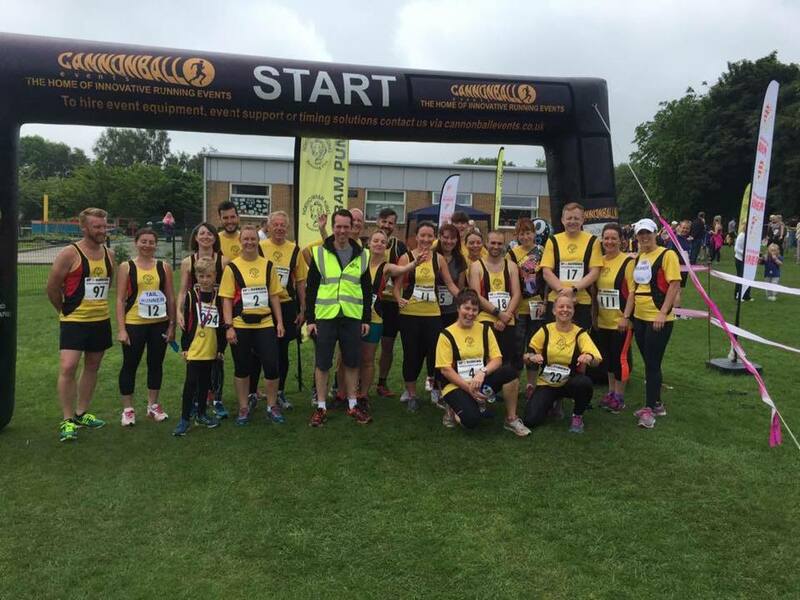 Well done to everyone that ran and thanks to our pacers. 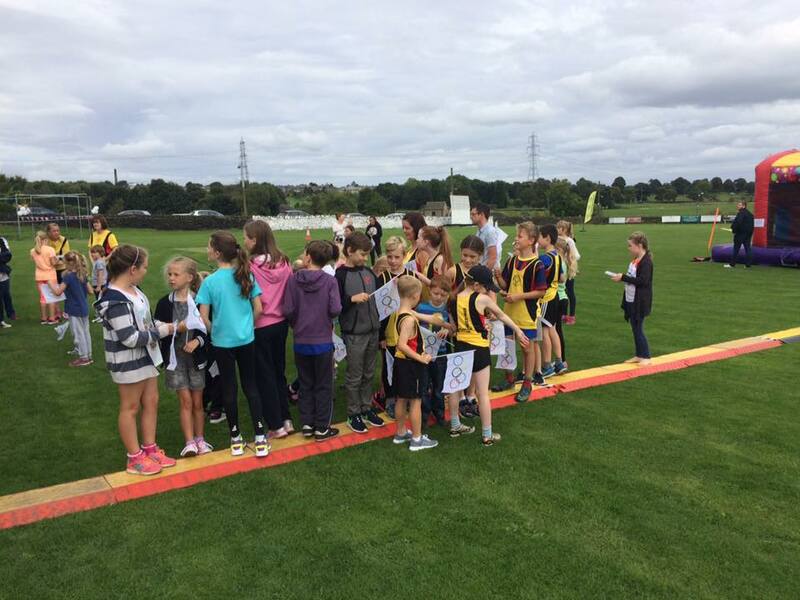 It was great to see so many Junior Pumas running but more importantly smashing their PBs! 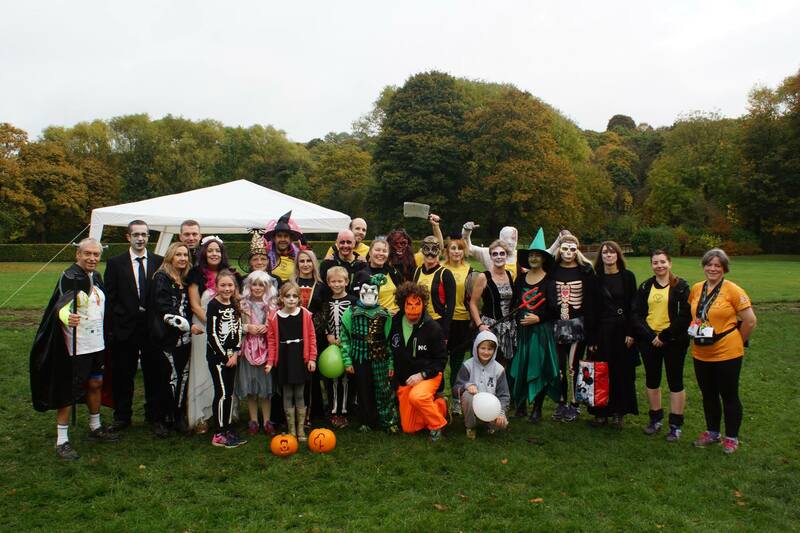 We also had some amazing support around the course and on the finish line as well as creepy things hanging from trees, pumpkins marking the way on the bridge, spiders that dropped on your head (just for Matt Newton!) and an amazing array of cakes, buns, biscuits and sweets. followed by Luke Cranfield (pacing 20mins) who as well as being complete with meat cleaver, was a little bit ahead of time and so was spotted hanging around for a while before crossing the finishing line at exactly 20:00. 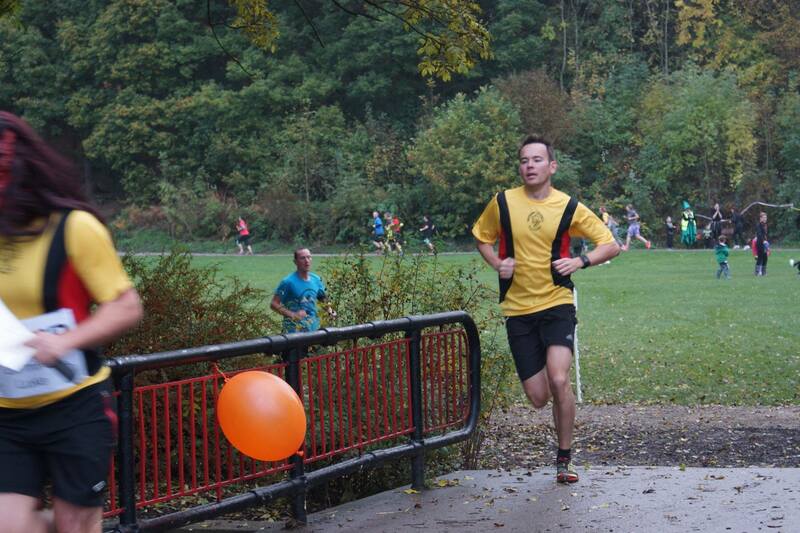 Next in was Andrew Tudor (linking Luke’s pacing to his new PB of 20:52). Junior Pumas George Eastwood was first Junior Puma home at 21:36 followed by Adam Standeven (pacing 22mins) and Richard Baker (22:47). 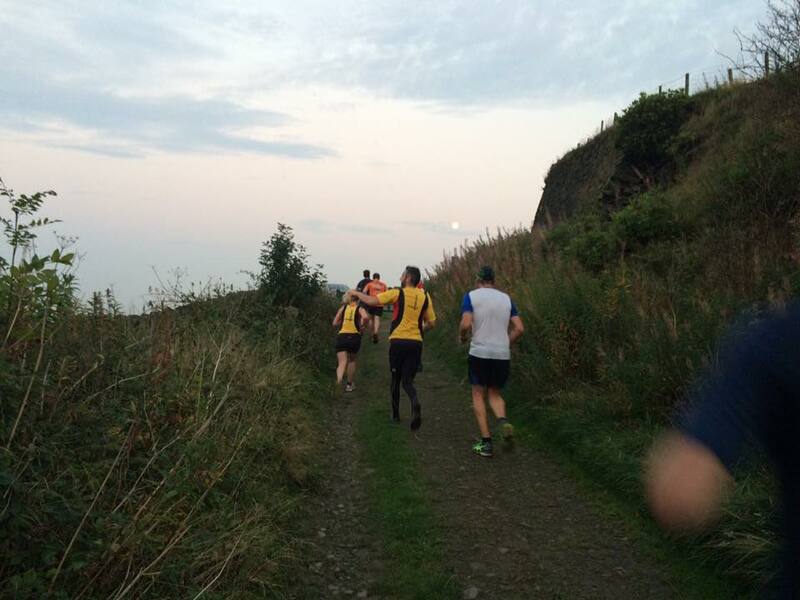 The next two were Juniors Ryan Moore (23:24 – first timer) and Jude Kenny (23:37) beating last week’s PB. Matt Newton pacing at 24mins breezed in next along with his new running friend who was delighted she’d got under 24minutes. 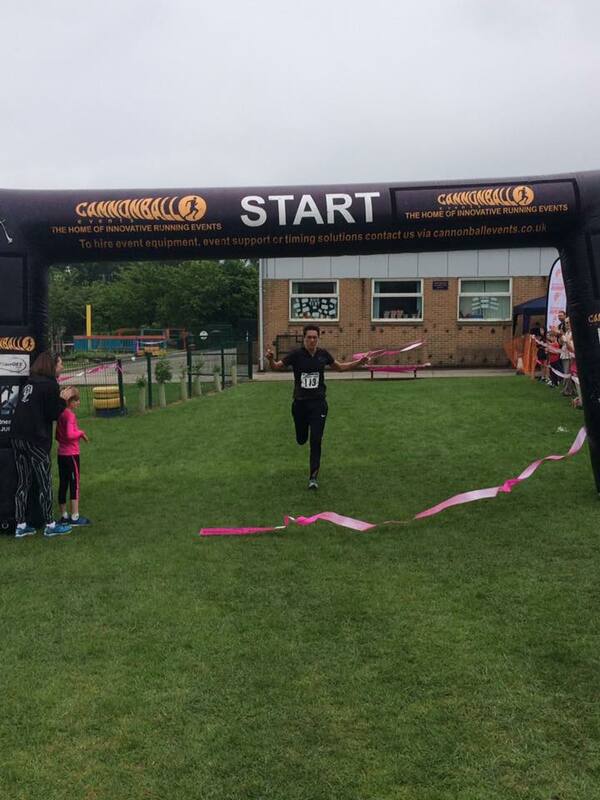 Paula Snee (24:04) and Rachael Helliwell (24:06) came in effortlessly next, closely followed by another PB – this time from Junior Noah Lumb (24:43). 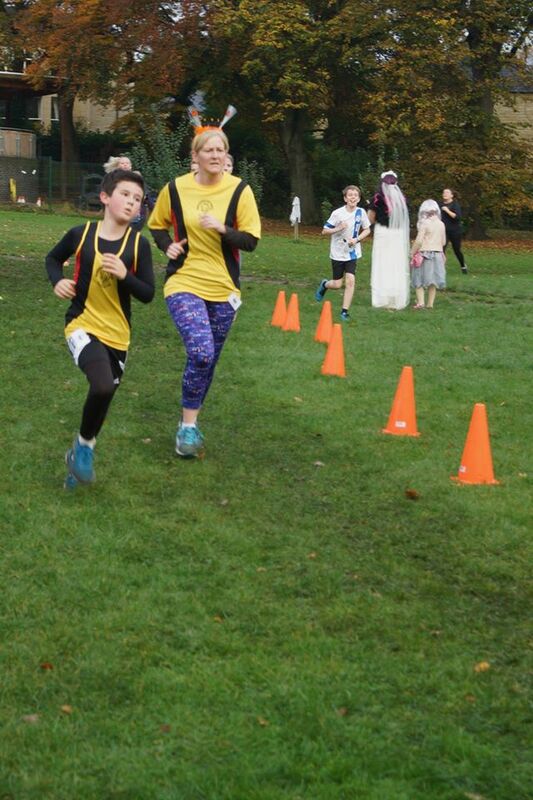 Shaun Casey (25:28) arrived next with Junior Reuben Bartkiw one second later (25:29) making his debut parkrun appearance with Dad Antony (25:48) who might have hinted he got the running bug again! 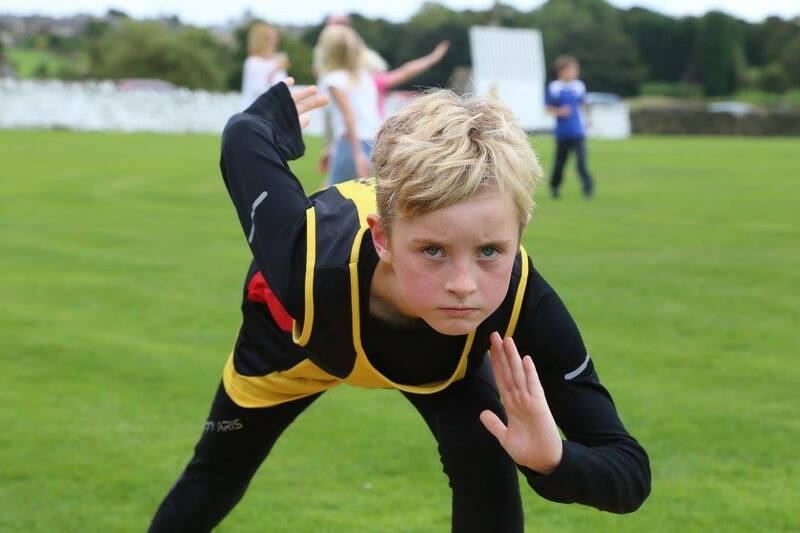 Another first timer Junior Puma was Sam Bell with an impressive debut time (23:43). 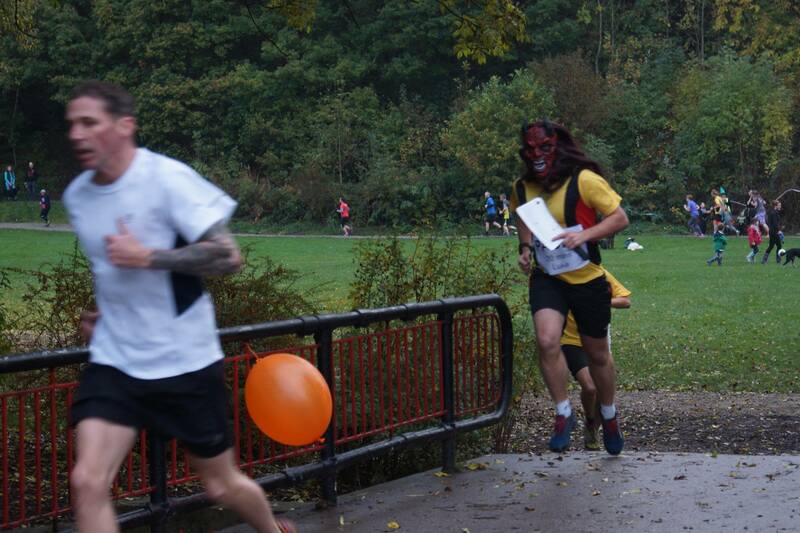 Neil Coupe with his orange pumpkin trousers, brown wig and mask (he says it was a mask) paced in just under his 26min time followed by Juniors Freddie Baker (26:44), Finley Canning (26:58), Jessica Cameron (27:13) and Amelie Baker (27:22) closely followed by Joe Baker (26:45) and Elizabeth Cameron (27:31). Well done to Freddie, Fin (who must have got his 30min pacing calculations wrong!) 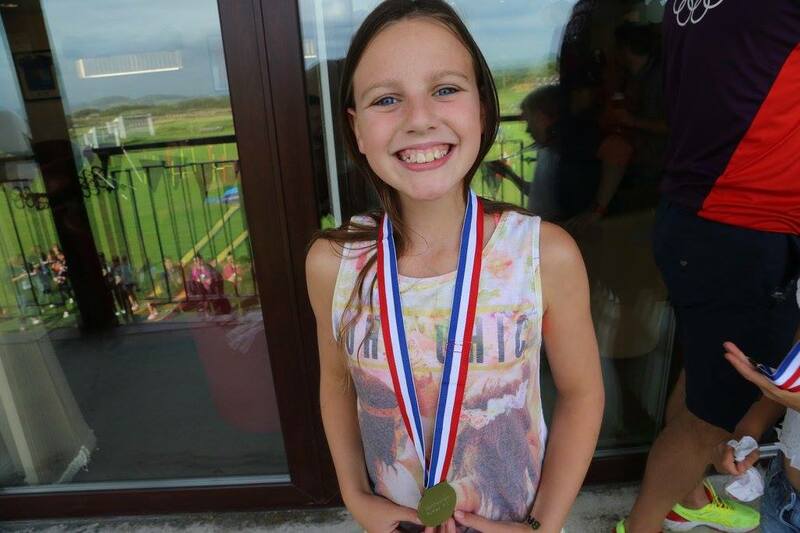 and Jessica who all smashed their PBs. 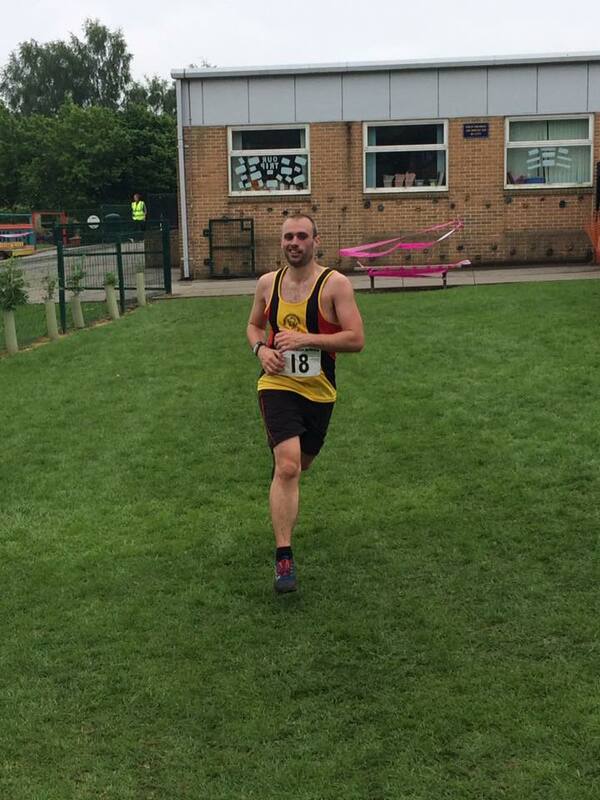 Next in was our very own blogger Johnny Meynell who beat the 28min pacer (himself) by 15seconds. Just pipping the 30m time was Amelia Jackson and Ian Marshall followed by Ally Canning arriving bang on time (pacing at 30m) followed by Mike Hartley and Lady (the dog complete with her very own bat wings) and another parkrun debut appearance, this time from Jeremy Bartkiw (32:27) accompanied by Mum Charlotte (32:38). 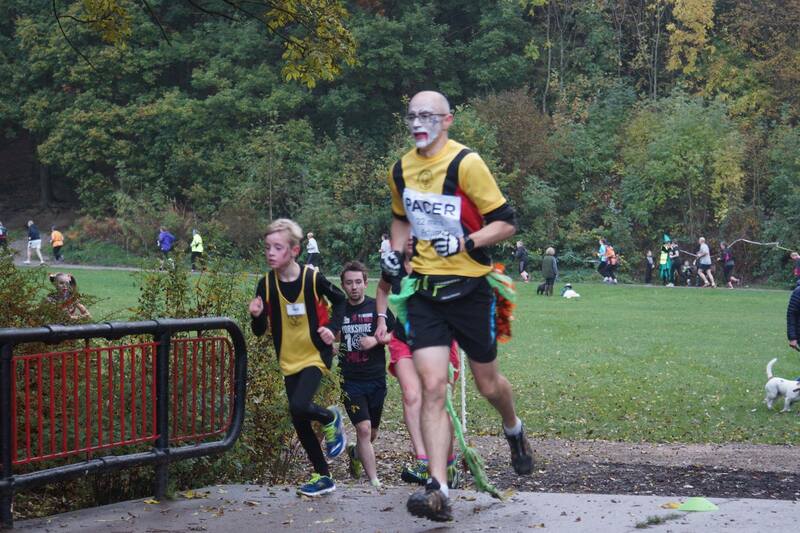 Cathy Heptinstall arrived at (34:59) doing some great pacing in her scary cheerleader outfit. 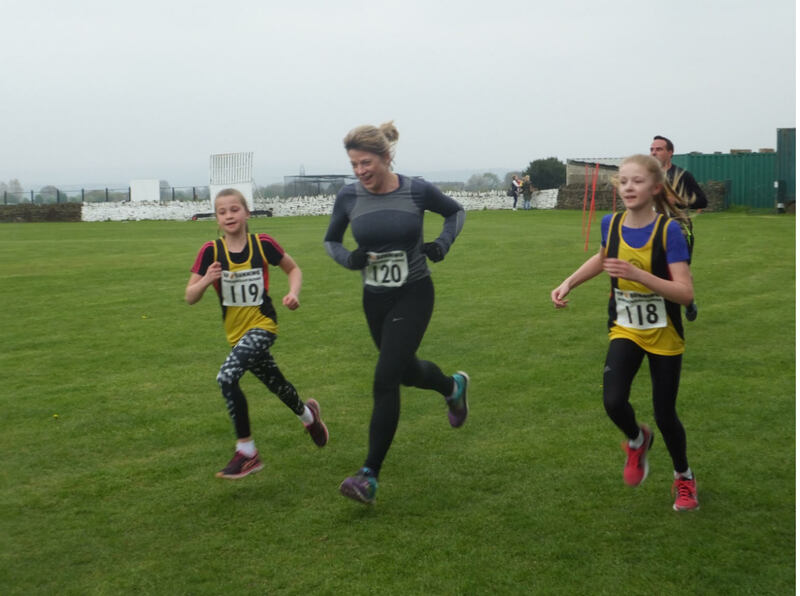 Next Puma in was Eileen O’Brien at 36:50, followed by some more first timers in Junior Pumas Miles and Elise Williams (38:14), Lana Brook (38:25), Elise Brook (38:50) with Mum Simone (38:54). Wendy Hewitt had the most important job and made sure everyone got home safe and sound – thanks Wendy! 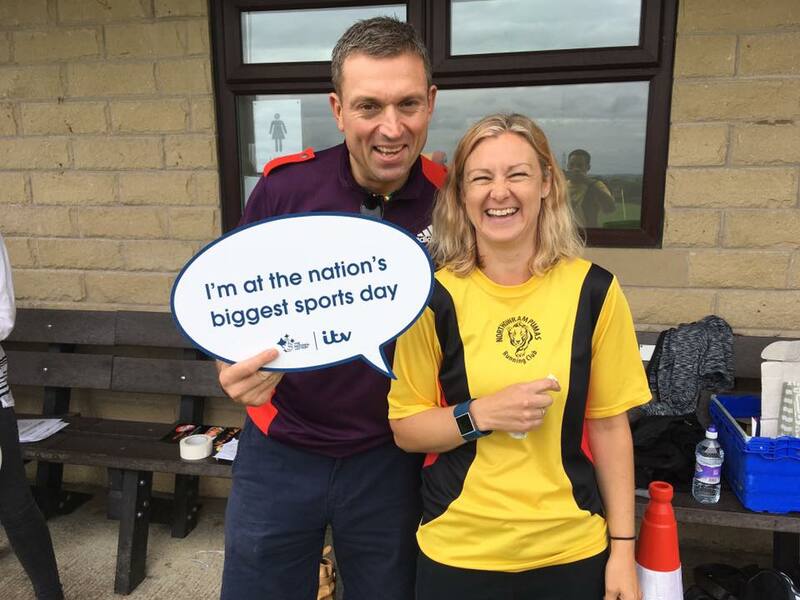 We also had lots of great comments after the event about our pacers: “Helen asked to thank Ally and Ian for pacing her to her first ever sub 30 parkrun” and “Having the pacers meant I slashed my PB by 25secs – thanks Pumas” – great comments to receive! Remembered to bring your barcode? We also couldn’t have done it without the fantastic Pumas who took the opportunity to leave their running shoes at home for one Saturday morning and help with the finish line tasks so that everyone got their results – Carine ‘skeleton’ Baker and Sarah ‘witchy’ Haigh doing the very important job of keeping everyone in line to get their finishing position token and Paul ‘vampire’ Bottomley and Jo Allen for the most important job of scanning. 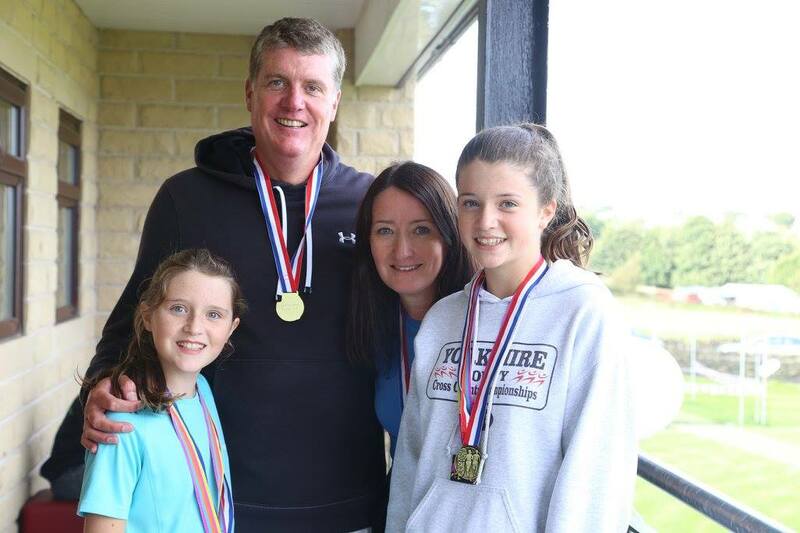 Our Puma support out on the course was fantastic – Gabby and Orlagh Kenny with their cow bell which could be heard in Northowram, Julie, Rob and Hollie Bowman, Melissa ‘jilted bride’ Hall and team, Alison ‘witchy’ Pearce and family as well as Nicola ‘sporty’ Pennington. Cakes, cakes and more glorious cakes! And whats the most important thing a runner wants after a run (after uploading Strava and checking their time!) – yes, cake! 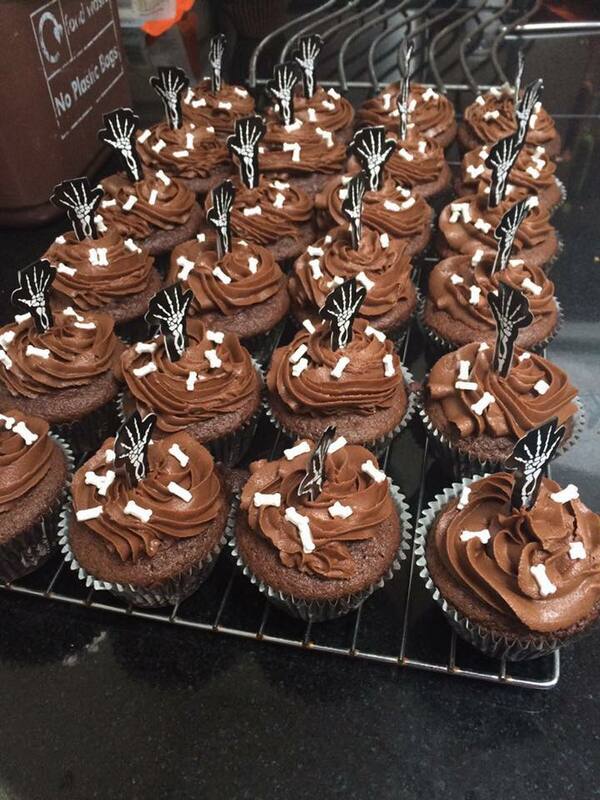 And our spooktacular cakes certainly didn’t disappoint – from scary brownies to pumpkin krispies, these were definitely the best bloodtinglying treats around. 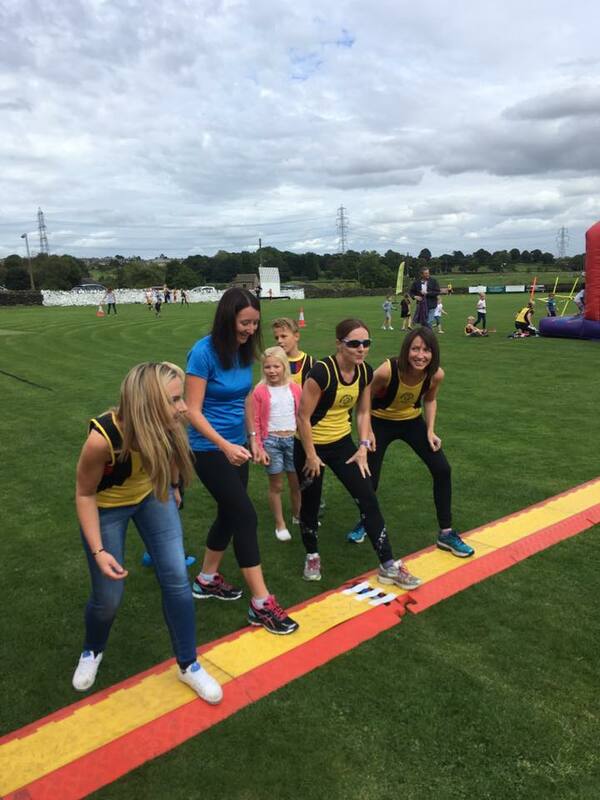 Thank you to Ally Canning, Ally’s sister, Victoria Owen, Nicola Hartley, Louise Lumb, Katie Lumb, Ian (and Mrs Marshall! 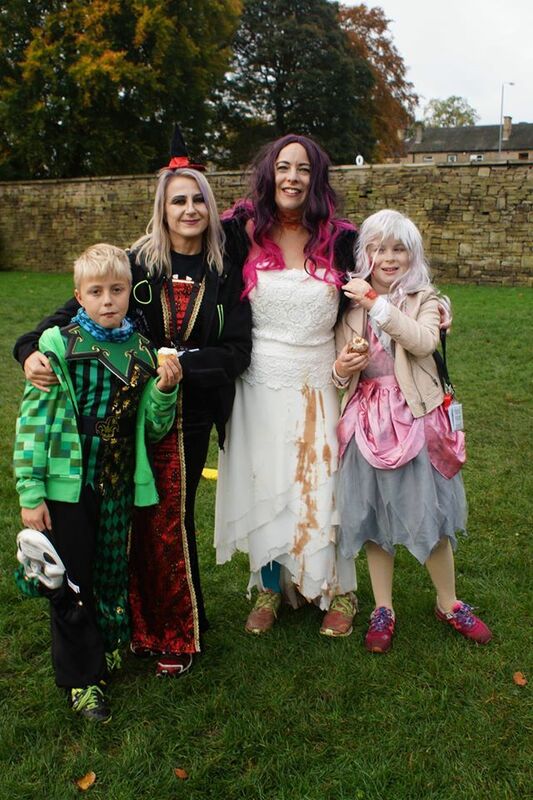 ), Charlotte Bartkiw and family, Carine Baker and family, Julie and Hollie, Elizabeth Cameron plus anyone who else who brought sweet treats and carved some amazing pumpkins for the bridge. Although there was no competition, the Northowram Pumas logo on pumpkin from the Bartkiw residence and the Junior pum(a)pkin from family Baker were definitely high contenders for the top spot! As always these events don’t just happen and so there are a few special thank you’s we need to make – to Jude and the team at Brighouse parkrun for letting us ‘takeover’, Nick Windsor for taking some amazing photos for us, Neil Coupe for helping out with transport and a massive thanks and well done to Ally Canning and Victoria Owen for organising the takeover, buying props and coordinating cakes! 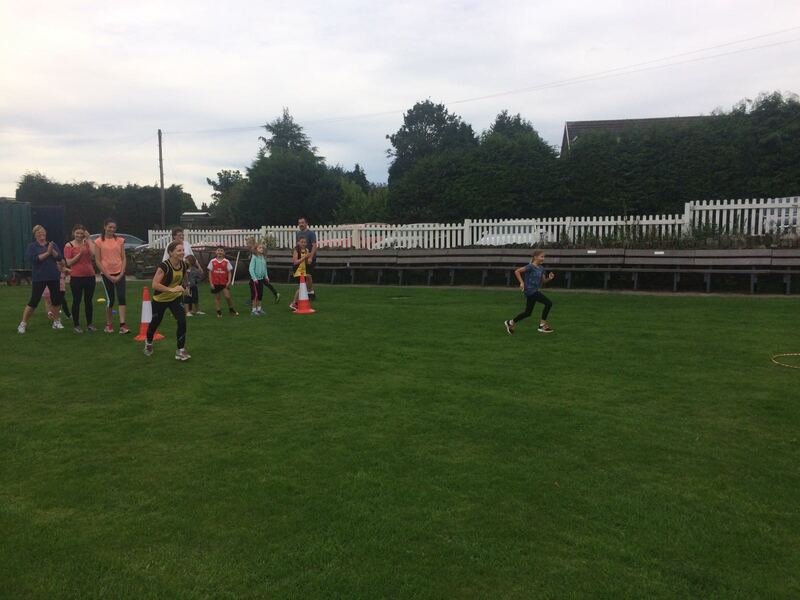 If you haven’t yet been to a parkrun, why not join in the fun? 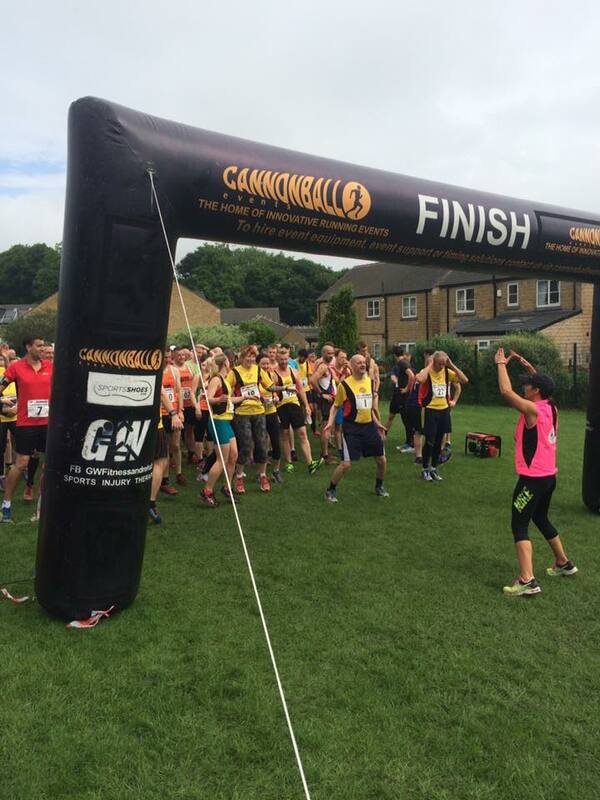 Just get yourself registered for free, print your barcode off and decide which of our local free, weekly, timed events you’ll go to next – you’re bound to spot a Puma there and it wont be the last time you go! 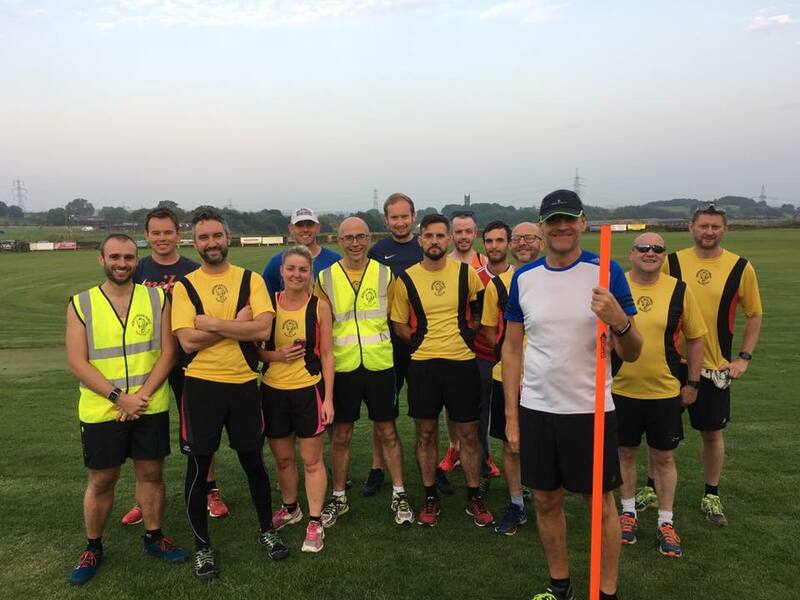 If you don’t fancy running, or want a change of scenery one Saturday morning, your local parkrun relies on volunteers to be able to do what they do. 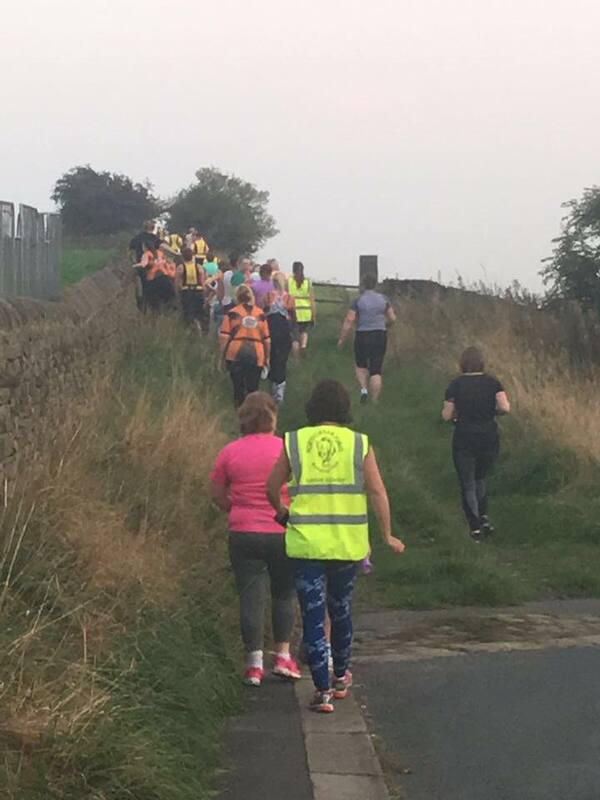 As part of our takeover at Brighouse and the amazing number of volunteers we brought along, some of the core team were able to run the course for the first time since the event has started – so thank you from them for ensuring that parkrun continues week in, week out! 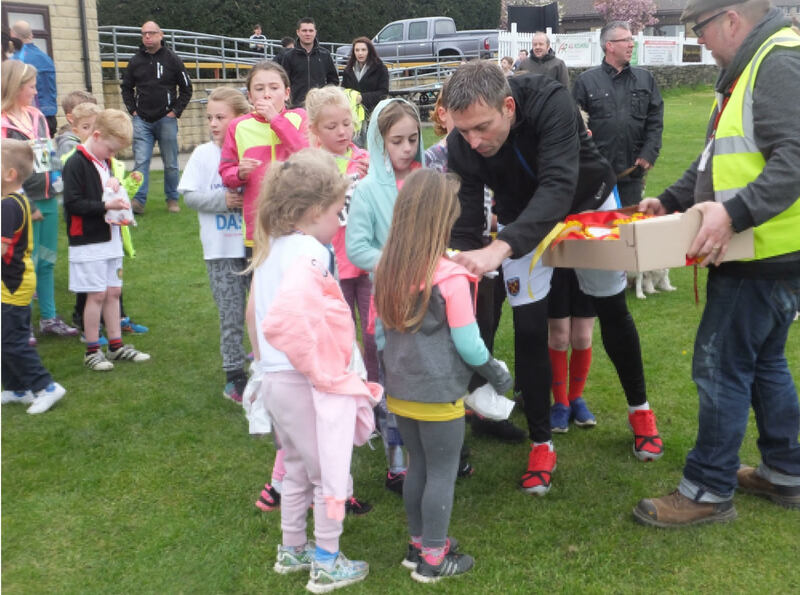 Northowram Pumas were founded in 2014, and each ensuing year will bring its own anniversary. 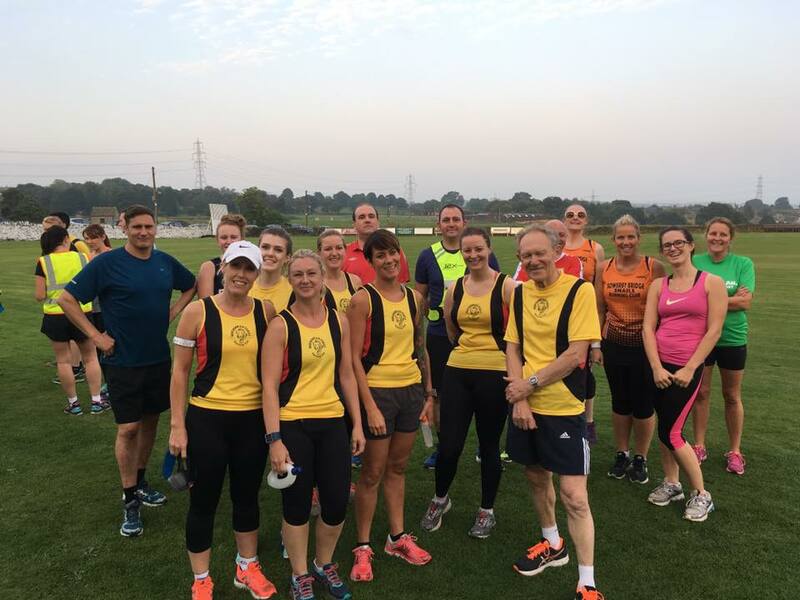 This week, the club celebrated its second ‘birthday’ and on Wednesday 14 September, we hosted our Second Anniversary Run. Lots and lots of Pumas turned up and everyone seemed really excited. Thanks to Johnny Meynell for his awesome account of the evening! Even if he looks slightly less impressed in the last photo (keep reading to check it out!!) – maybe he’s just reminiscing about his old university days. And of course, with it being a special occasion, what better than to invite a few friends round? Happy to take up our invitation were the fledgling Sowerby Bridge Snails, who arrived en masse. Mm, Snails. It rather gives the impression that these are folk who move perhaps just a tad faster than walking pace, but don’t be fooled, they are Snails in name only. 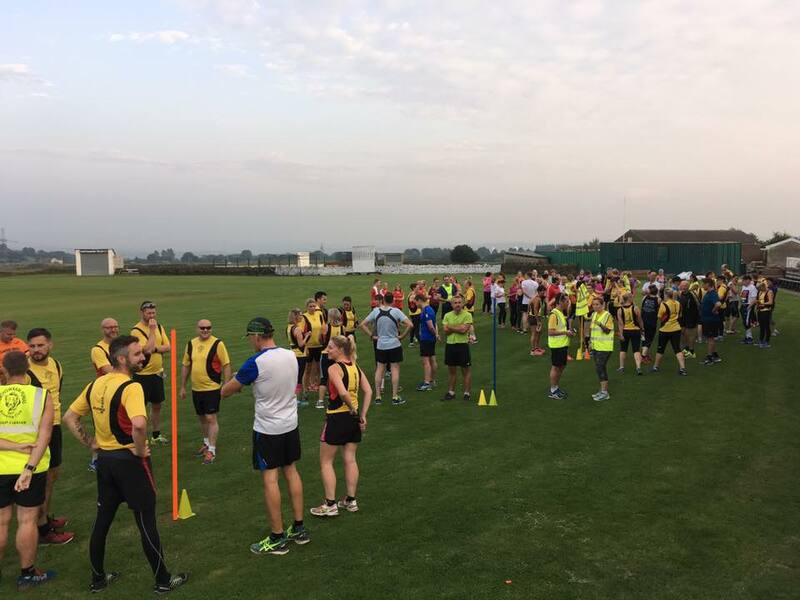 I have it on good authority that one attendee last night has run six parkruns, each time a personal best, with his last outing recording a time of 20:37. And he has a friend, another Snail, who’s even faster than him! 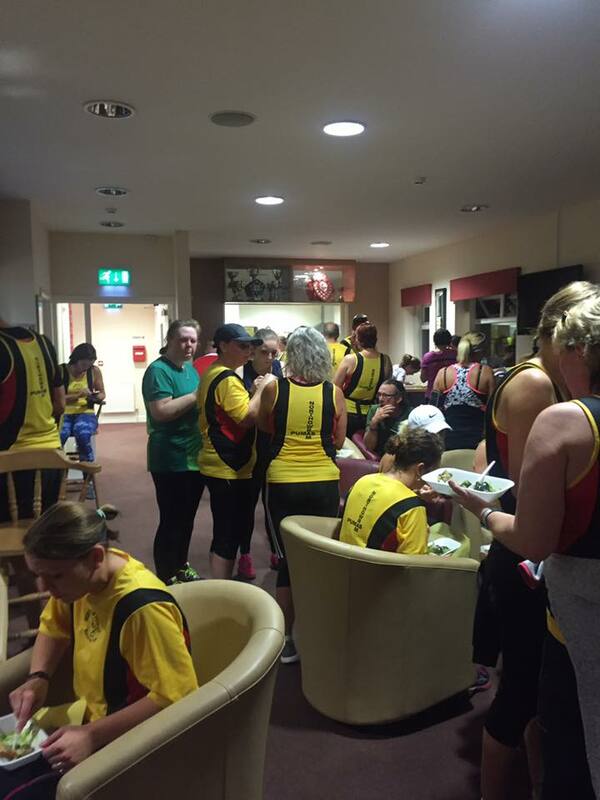 The Sowerby Bridge Snails can’t have failed but to be impressed at how organised we were pre-run time. 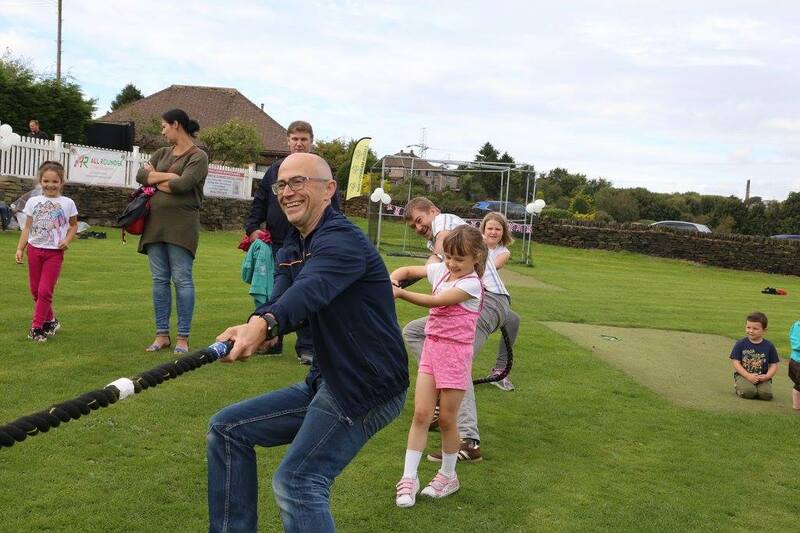 With so many extra runners, it was decided it’d be best to assemble on the cricket field with poles to indicate the different groups. What a splendid idea. The plan worked, and how simple it must have been for Simon Wilkinson to take the customary group photos when everyone was ready at their stations. 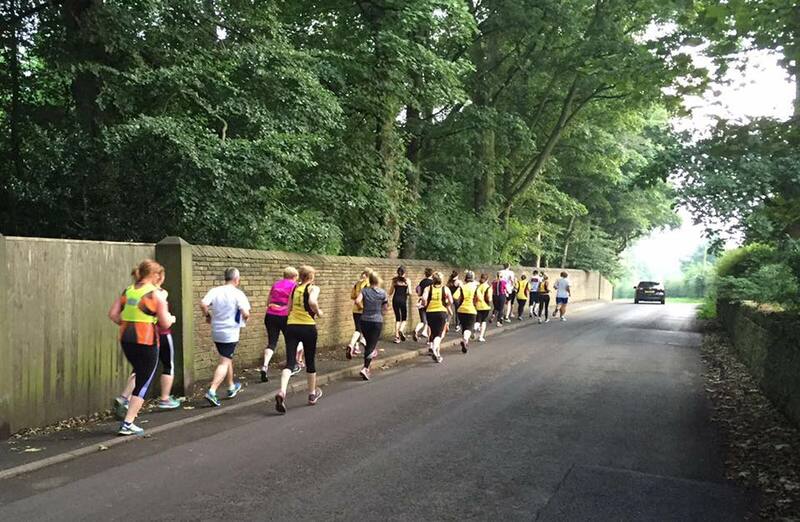 I went in Group Two, which was a cosy run up through Coley, Shelf, all the way up Giles Hill Lane to Brighouse/Denholmegate Road, down Syke Lane to Green Lane, then home via Blake Hill End and Upper Lane. 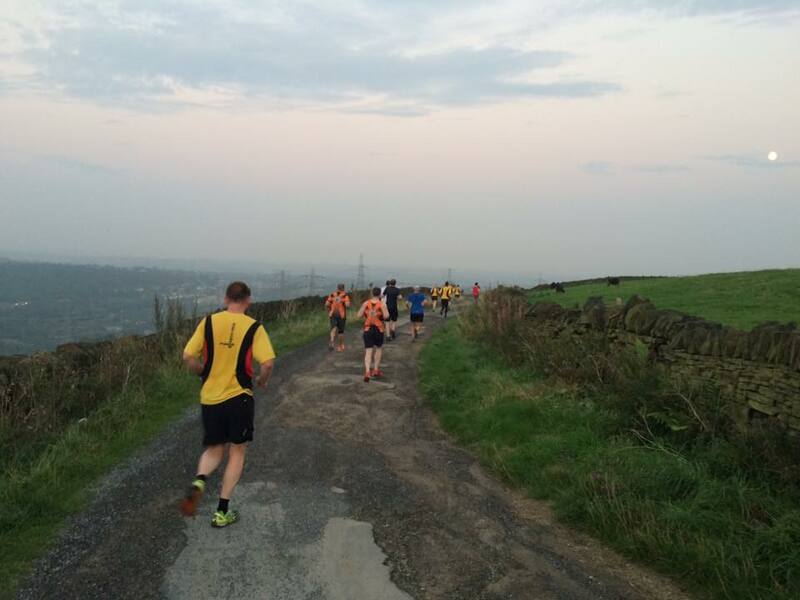 It was a warm evening which made the going even tougher than already expected, and we hope that the Sowerby Bridge Snails appreciate the terrain we have to negotiate on a weekly basis, the general rule being that you either start up a hill or finish on one. The general feedback on the routes undertaken by our guests in the various groups seems to be that they enjoyed it. The exact figure of how many Snails were actually in attendance cannot be verified, but in the words of the late BBC news reporter Brian Hanrahan, “I counted them all out, and I counted them all back.” Later, it was put to me that there were forty orders from the Snails for meat pies, and one veggie pie, which in anyone’s book would be roughly forty-one. Whilst the Snails came through largely unscathed, sadly the same cannot be said of the Northowram Pumas. If Strava is to be believed, then Group One (Luke’s!) ran a distance of anywhere between 6.3 and 7 miles. Luke’s group – before losing half this contingent. Not only that, but a contingent also managed to get lost! Still, nobody was hurt in this group, unlike in Group Four, where Joanne Davison’s unscheduled route took in the A&E after she fell shortly into her run. Accompanied at hospital by Jane Henley, it turned out Joanne was none too seriously injured, and escaped with bruises on her knees and legs. 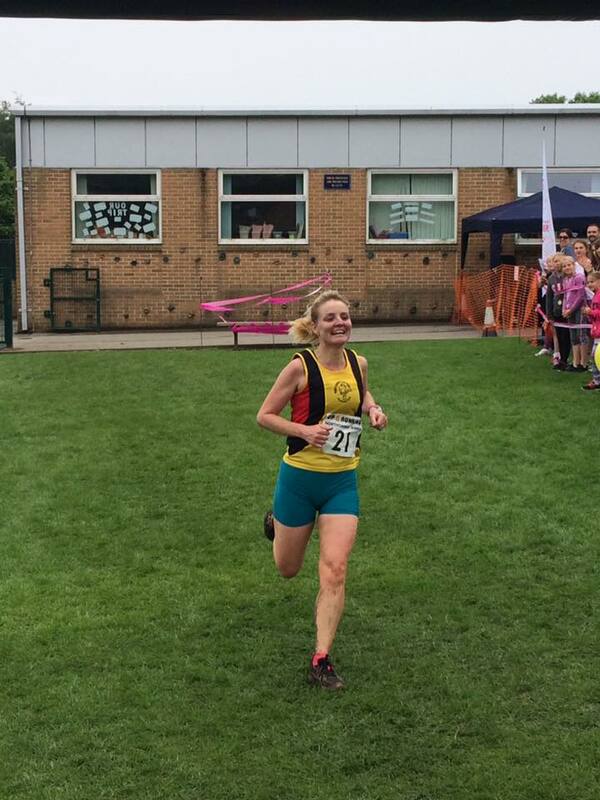 For the rest, it was a run to the finish back at the club, and runners sprinted/ran/ jogged/staggered* (*delete as appropriate) over the line, happy in the knowledge that the BAR was open. 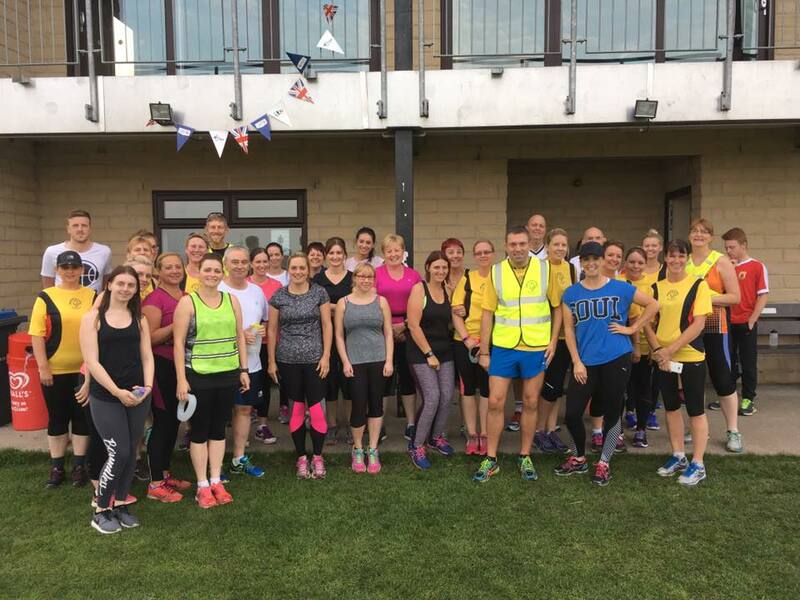 Yes, it is a measure of how the Northowram Pumas have grown that we now have fully trained bartenders, and happily after each run, we can now socialise with a bevvy. The runners piled into the bar, where they were served by the Three Amigos, namely Simon Wilkinson, Matt Newton and Tom O’Reilly. 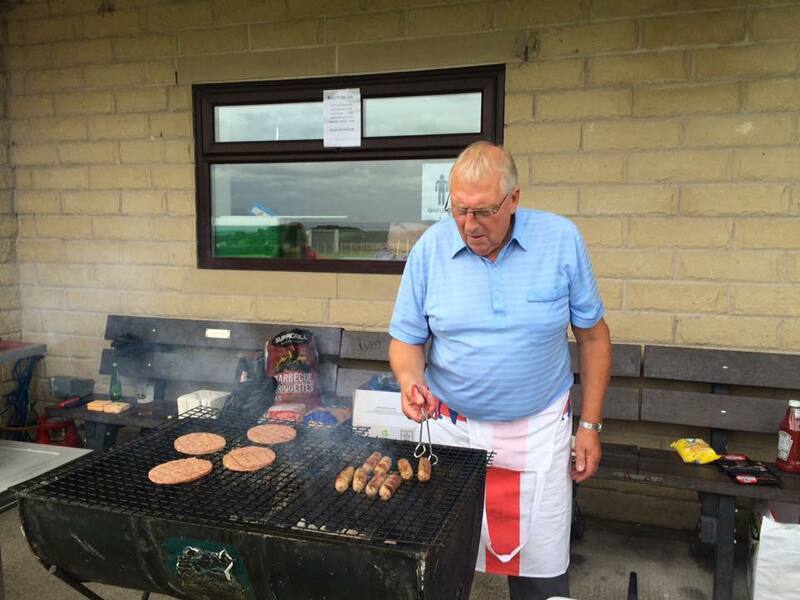 Ally Canning was also seen serving so waiting time was kept to a minimum – great service. I’ve never been served so quickly since I ventured into the Long Chimney circa 1988 (though in their case they poured me a drink before I changed my mind). And as it was a special occasion, food was also being served; the aforementioned meat and veggie pies. I chose the Cornish slice, which evoked memories of a holiday in St Austell some twenty years ago! Here, thanks must be given to those who helped prepare and serve the food, and we are most grateful for the behind the scenes work done by Tracey (who made sure the pies arrived on time), Holly, Andrea and Ian Marshall. And let us not forget those who took time to bake cakes, etc which topped off suppertime. Most of us stopped for well over an hour, giving Nicola enough time to present Jessica Edwards with her Uni Survival Kit in front of a packed house. 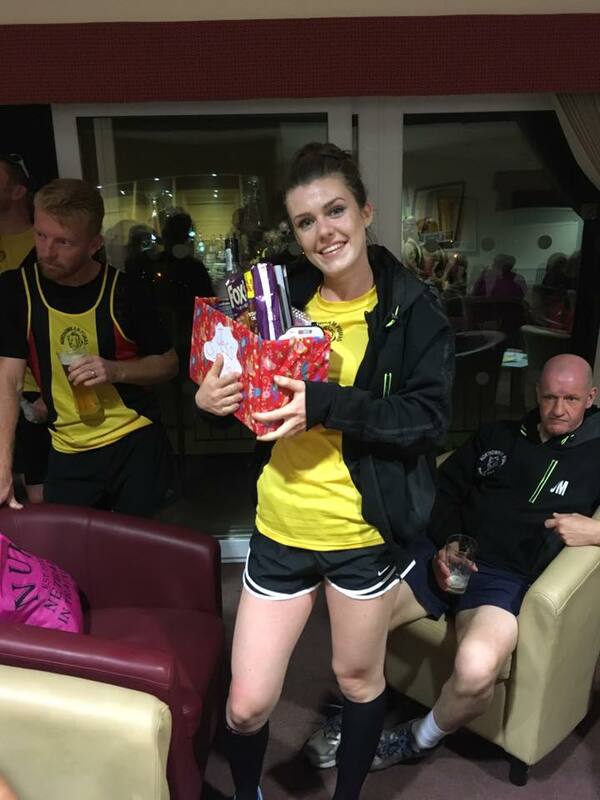 Jess, who’s been with the Pumas since the formative days, has helped in various capacities and now leaves for University with our good wishes. 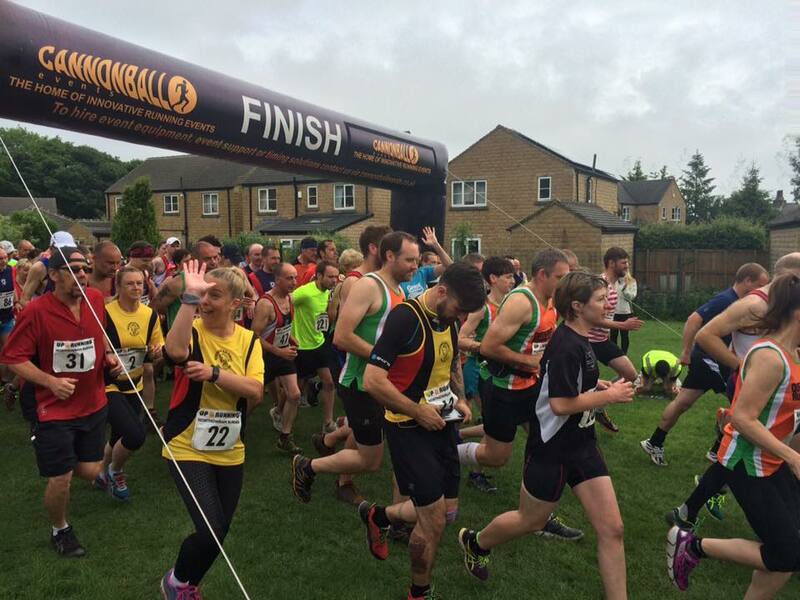 All-in-all, it was a pleasant evening and thanks must be given to those who made it possible, as well as to all the Pumas and Sowerby Bridge Snails who turned out in force to make the event such a success. Dare I say it, here’s to the next one…. Literally, since I started running, every time I go on holiday I dutifully pack my running clobber and tell myself that I will, at least once, go out for a run while I’m away. And I suspect like many people, I never actually do. I drag all my stuff there and it sits in the bottom of my suitcase (hidden under other things so I’m not reminded about it) completely untouched until I get home again. 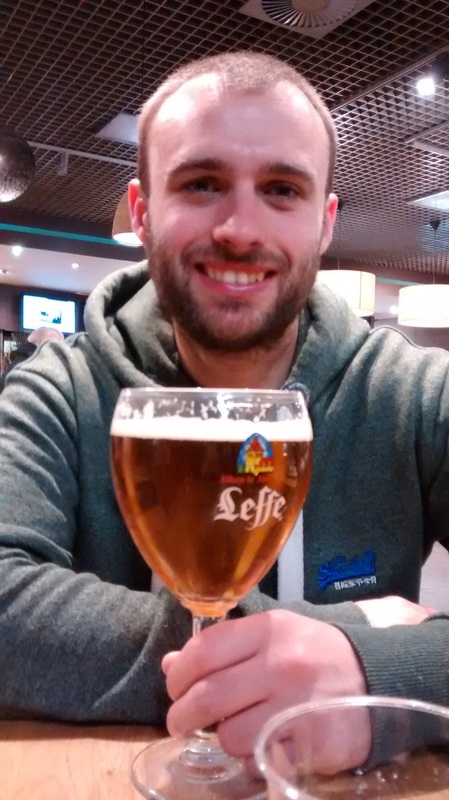 But, I recently went to Brussels and I discovered something that will change my lack of holiday exercise forever. SIGHT JOGGING! I think the name pretty much gives it away, but basically it’s a sight-seeing tour that’s based around running. 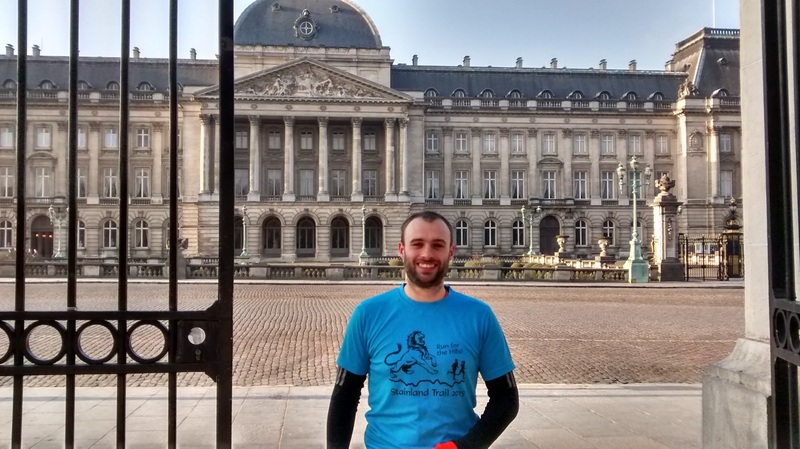 In Brussels, we booked our tour through Brussels Sight Jogging. We booked our tour before we went. It cost us €64 for 2 people and as the tour lasted upwards for 2 hours I think this was pretty good value. The website gave information on a number of different routes you could do, we plumped for the ‘Old Brussels’ tour as this covered the main highlights of the city centre. Our sight jogging guide, Alexandre, met us outside our Air BNB (another awesome holiday must!) accommodation and off we went. Alex was happy to run at a pace that was comfortable for us, which was good. And over the next 2 hours we covered about 7 miles in and around the centre of Brussels. It sounds like quite a long time to be running, but we had a lot of stops at different places of interest where Alex would give us a bit of history or story about a particular building or monument. By doing the sight jogging we got quite a good idea of the layout of the city centre, which made the rest of our weekend a bit easier as we weren’t spending it getting lost! We also saw a lot of things that I don’t think we’d have ever come across or known about if we hadn’t done the guided run, as your guide is a local they know all about the interesting parts of Brussels and the history behind them. It’s much more interesting than just reading it out of a guide book. Alex was also happy to give us recommendations about where to eat and drink and also where to avoid! Plus, it burnt off enough calories to cancel out all the beer and waffles (ha, it totally didn’t but that’s what I’m telling myself)! I would whole heartedly recommended sight jogging. Most major cities seem to have companies that offer it. And it is a great way to get a different view of the place you’re staying in. 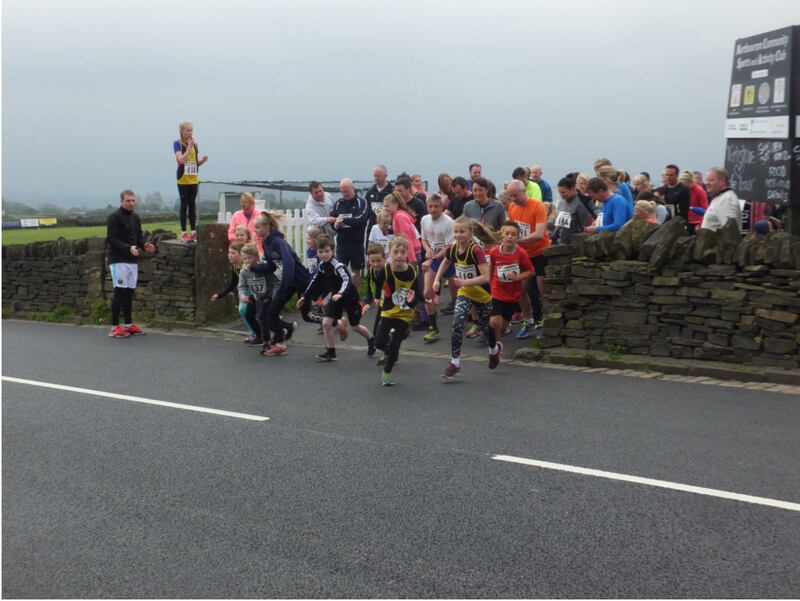 Northowram Pumas Running Club got 2016 off to a healthy start with a 2,016m family fun run, raising more than £1,000 for charity. 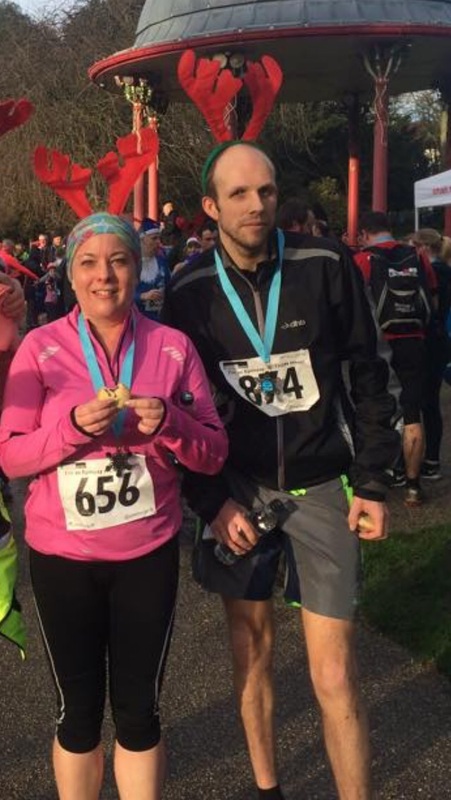 The friendly local club hosted the New Year’s Day event to boost the London Marathon fundraising efforts of four regular members. To sponsor Shaun or Adam you can visit their just giving pages. Click here for Shaun or here for Adam. Shaun and Adam are both raising money for The Children’s Trust. 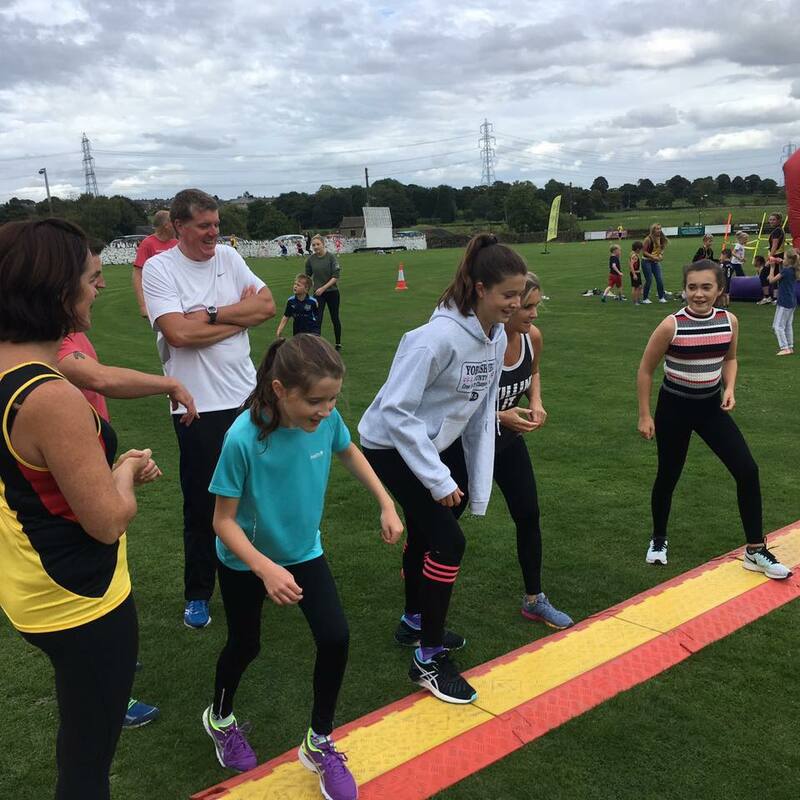 A total of 124 people of all ages took part by running or walking 2,016 metres (about 1.3 miles) or a more challenging 5k route. 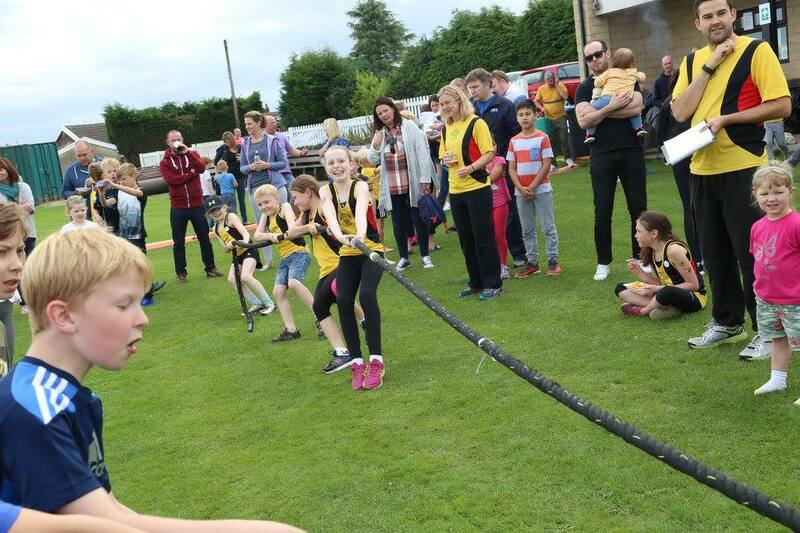 The support from the local community was overwhelming and ensured it was a huge success. 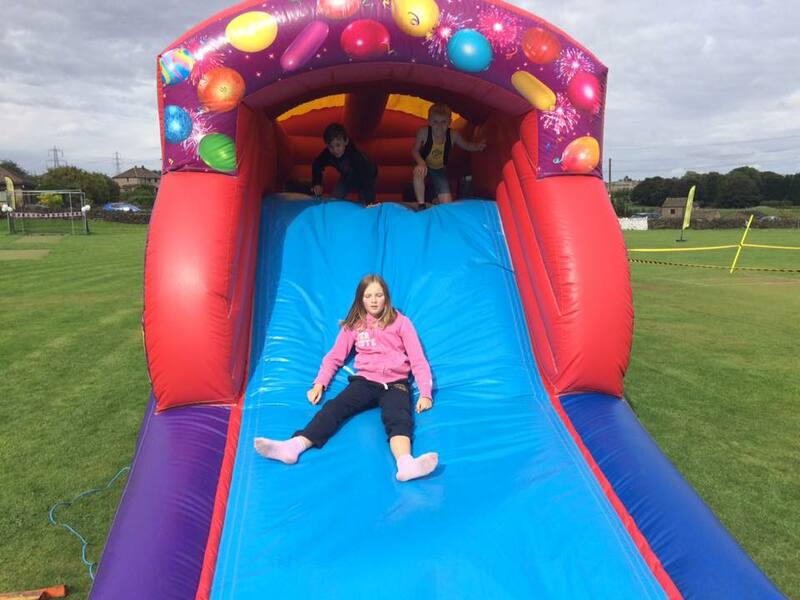 It is an impressive achievement, being the first attempt at a charity extravaganza for the relatively young club, founded in September 2014. 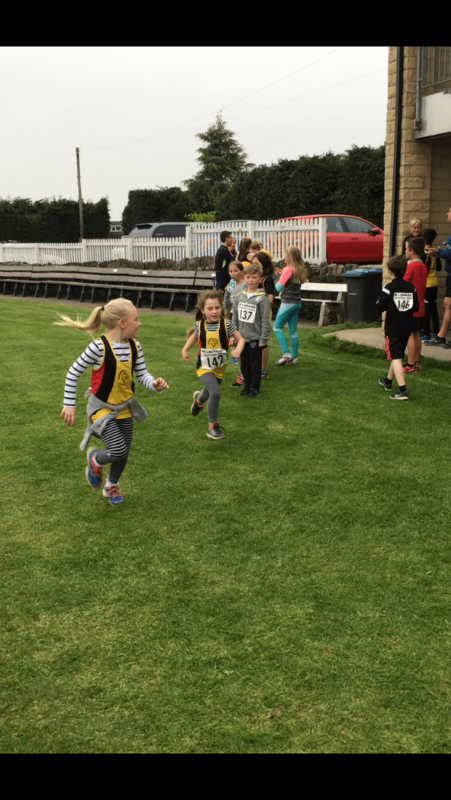 As well as being a fast cat, Pumas are great leapers – which made the club’s mascot particularly apt for runners welcoming this leap year in style. 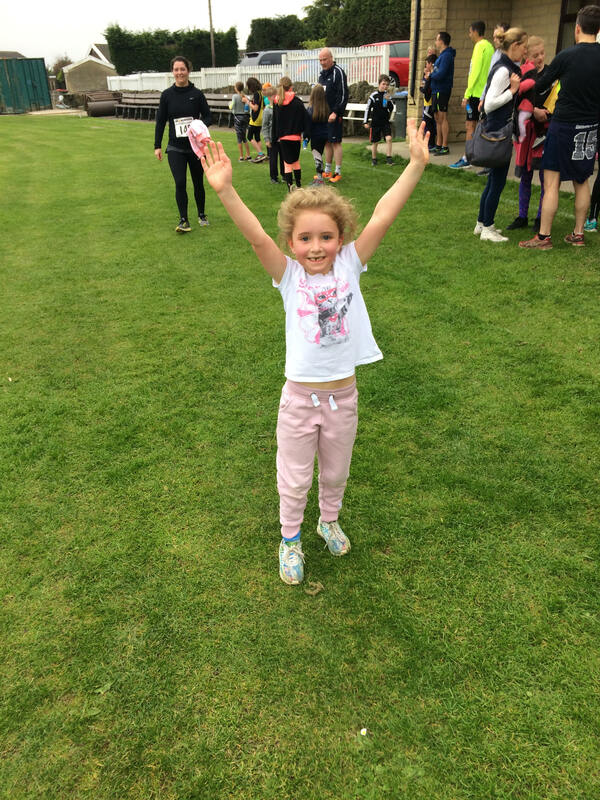 The younger entrants proved their potential as prospective Pumas by leaping for joy as they crossed the finishing line. 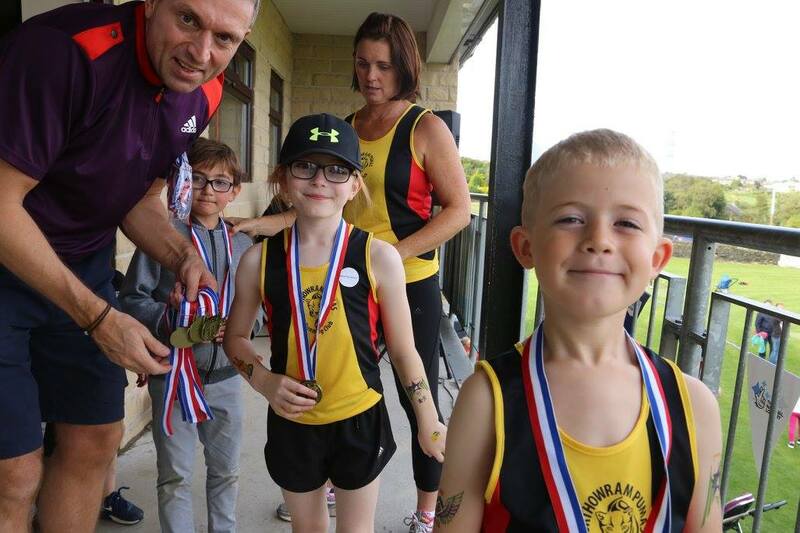 All 47 children who completed the run were awarded with a finisher’s medal. Following the recent flooding the local area had suffered over Christmas, the organisers were relieved there was no sign of any rain to dampen the spirits of the enthusiastic crowd. 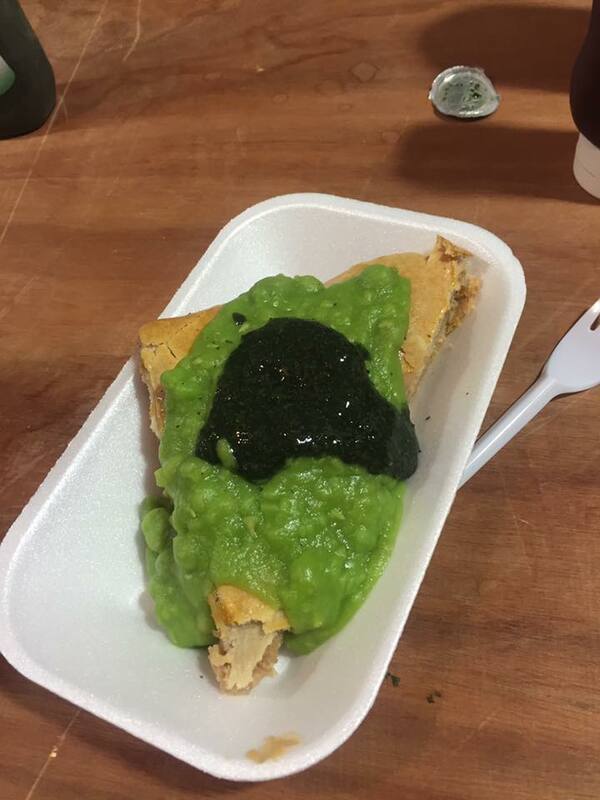 The frosty weather, which would have made a Puma feel at home in its freezing mountainous surroundings, did not deter the runners, and only made their hot pie and peas lunchtime reception even more tasty. 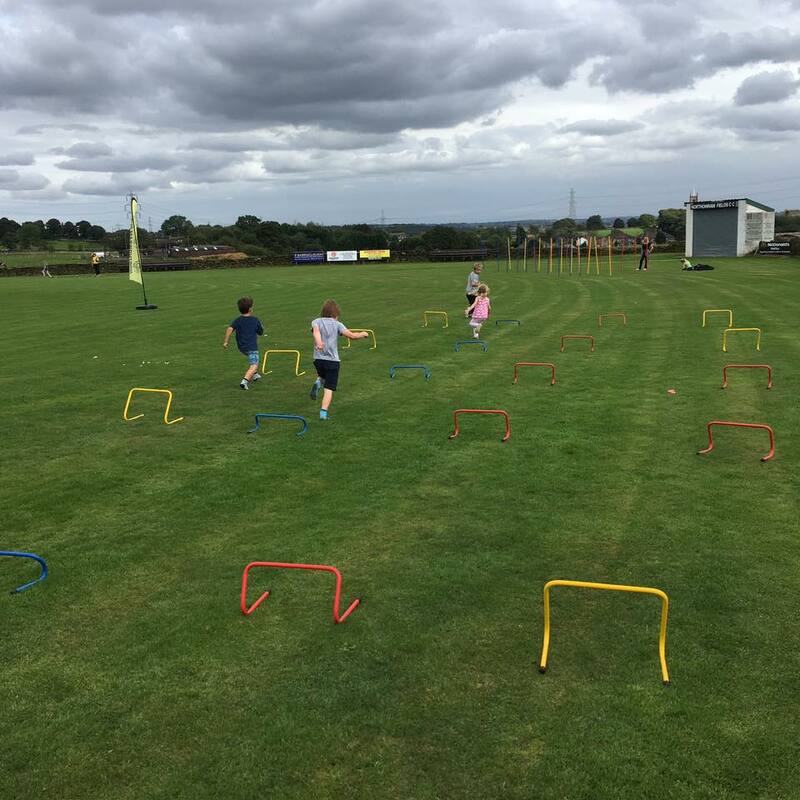 Many family members joined participants to create a buzzing atmosphere at Northowram’s Community Sports and Activity Club, and enjoyed the hot food and a selection of homemade cakes kindly donated by friends of the club. 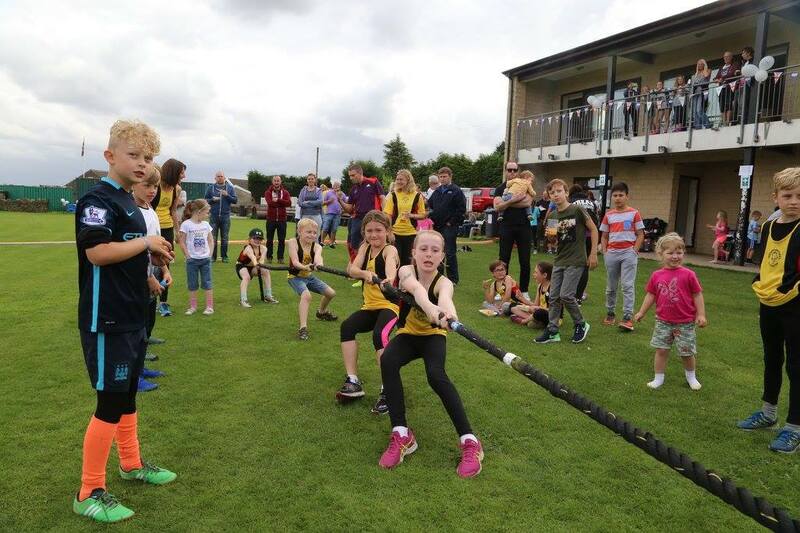 Local businesses rallied around to support the event, meaning there were some fantastic prizes up for grabs in a raffle, including a HD ready TV and DVD player, FatBoy beanbag, £50 golf vouchers and £50 worth of natural bees wax candles. These star prizes were kindly donated by local businesses Benjamin James Flooring, Aerial Waves, Stromberg Golf and Root Candles. 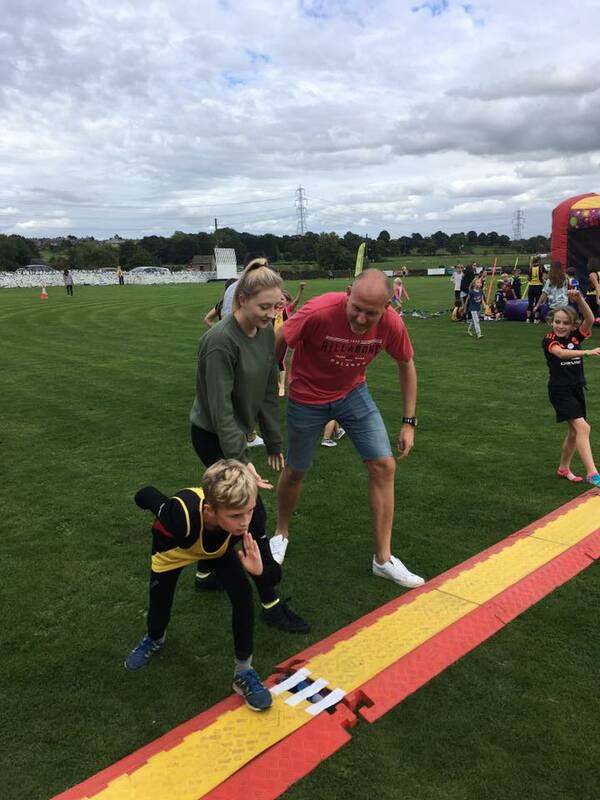 Local building firm Red House Construction sponsored the event, meaning 100% of funds raised will go to Sense and The Children’s Trust (the charities that Puma runners Deke Banks, Shaun Casey, Adam Standeven and Andrew Tudor are representing in the London Marathon). Ludbrooks estate agents have offered a free house sale which is being put up for silent auction on behalf of both charities. Any interested parties are asked to contact shaun@wearenorthlight.co.uk to find out more. Members of the surrounding community are invited to hold the date for next year’s challenge of starting 2017 with a 2,017m fun run. 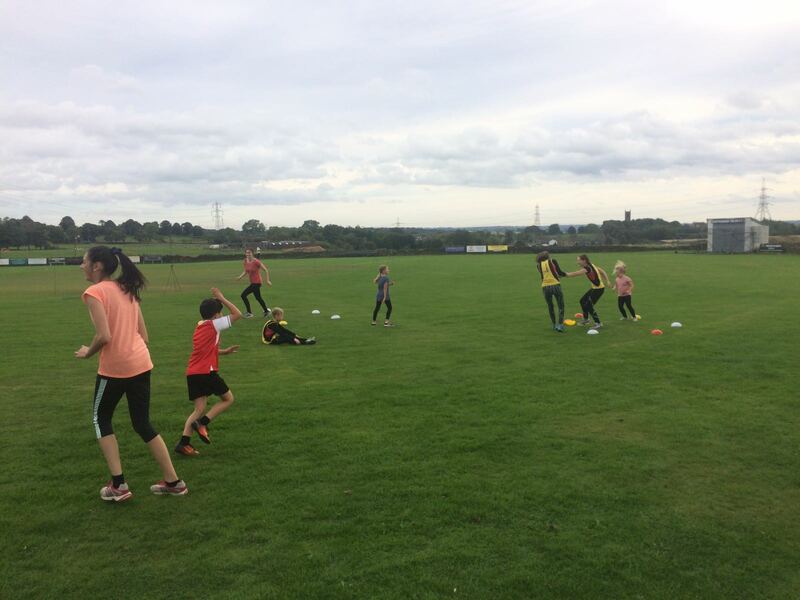 The Pumas meet every Wednesday at Northowram Community Sports & Activity Club to begin running at 6:30pm. 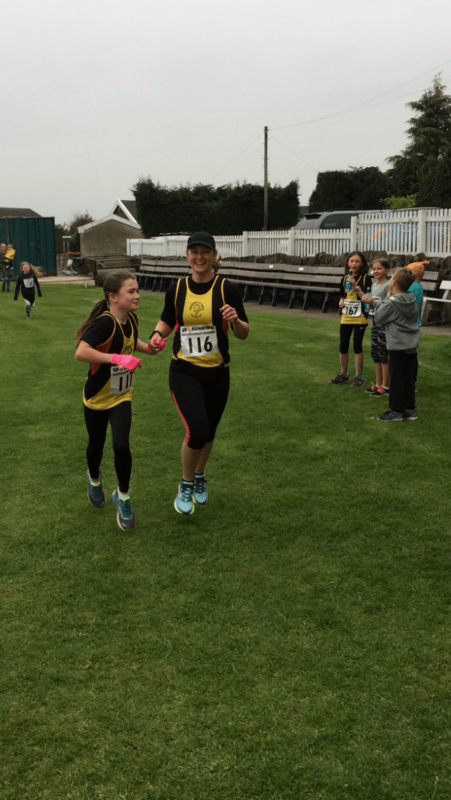 We welcome runners of all ages and abilities, with qualified run leaders. Further information can be found on our training page here. 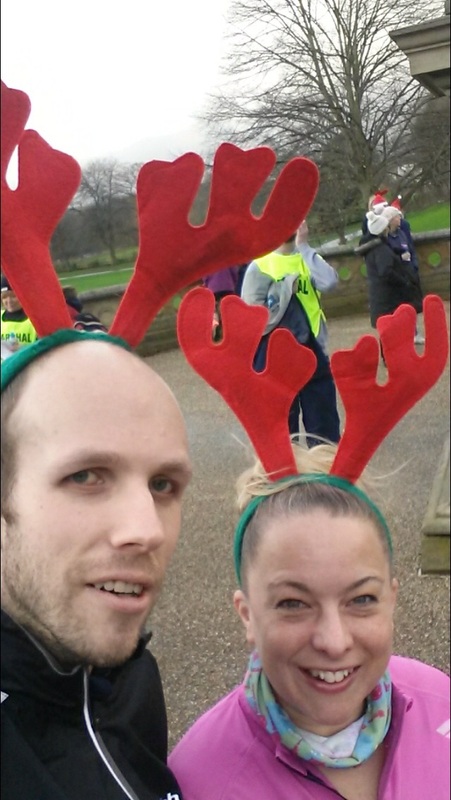 Matt Newton and Melissa Hall put their best hoof’s forward in the Reindeer Stampede organised by Epilepsy Action on Sunday 6 December at Roberts Park in Saltaire. The 5k fun run started at 10am and saw Matt and Melissa battle with some very fetching reindeer antlers. Giving the windy conditions on Sunday morning getting the antlers to stay put was somewhat of a challenge! The track was multi terrain and slightly flooded in places, which made it a bit more challenging. But thankfully at the finish line there were volunteers on hand to give out medals, water and more importantly a good old mince pie. 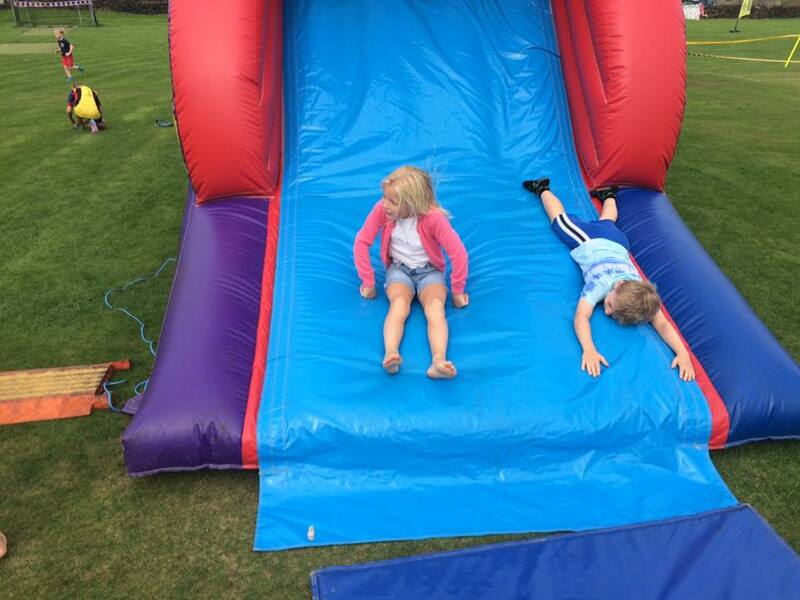 Matt and Melissa agreed with event was really well organised and very enjoyable (as the pictures below show! ).